Winter whites is quite the trend for 2012-2013. How fabulous is it to incorporate a bright element to our dreary winter wardrobes of black and grey, and extend the season of favorite white jeans? And how ridunculously cute is the ChinqueCento? (Fiat 500 in Italian) Perhaps a future reversecommutermobile? Sunglasses Loewe, Jeans Rag & Bone, Blazer Prada, Long sleeve t-shirt T by Alexander Wang, Zara smoking slippers & YSL bag. 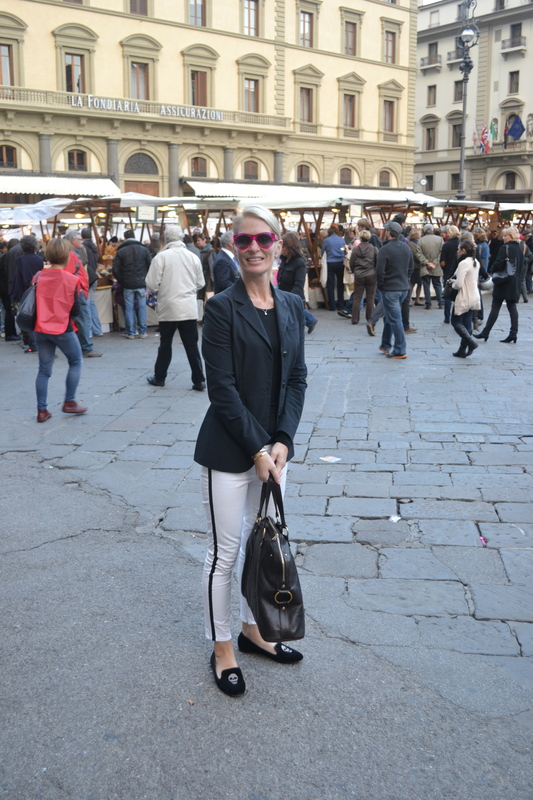 Market in the center of Firenze. This entry was posted in accessories, Architecture, Fashion, Media, Shoes, Shopping, Technology, Travel, Uncategorized and tagged Fiat 500, Fiat Cinquecento, Florence, Italy, LOEWE, market, Prada, Rag & Bone, Smoking Slippers, T by Alexander Wang, Winter Whites, YSL, Zara by reversecommuter. Bookmark the permalink. You make it so stylish!!!! Still loving your rose colored glasses!! You know I’m in love with your sunnies! You look amazing! and thanks for the likes – much appreciated!